Useful Gadgets - The Connect-A-Desk Laptop holder. 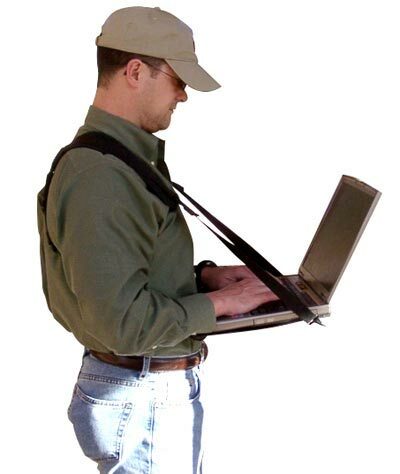 Here’s a useful gadget, that lets you use your laptop whilst walking around. The Connect-A-Desk is a new product that gives you the ability to use your laptop with both hands free, to type while walking or standing. Includes the laptop harness & desk, everything you need to use your laptop computer while standing. The Connect-A-Desk works with any size laptop, notebook, or tablet computer and is easily adjusted to fit any size person. Quick and easy to put on and take off and ergonomically designed for comfort. It’s truly mobile and portable, no need for a laptop cart or stand. This looks like a really useful accessory for your laptop, just think you could use it whilst walking to work and you won’t look stupid, honest ! The Connect-A-Desk laptop holder is available to buy online for $39.99 from ThinkGeek.